Hennessey Performance Engineering are the guys who can take an already great car and make it even better. Having been building vehicles 1991, their 10,000th edition will be unveiled as a 2019 Hennessey Heritage Edition Ford Mustang. Limited to just 19 vehicles, the base platform will be a Mustang GT featuring the Hennessey’s HPE800 upgrade kit, carbon fiber front splitter, side skirts, rear spoiler, and engine coilpack covers, white racing stripes and a cool number ‘1’ on both its sides. Specially set up suspension, Brembo 15.1-inch rotors brakes, 20 inch custom forged wheels with Michelin Pilot Sport Cup 2 with tires. 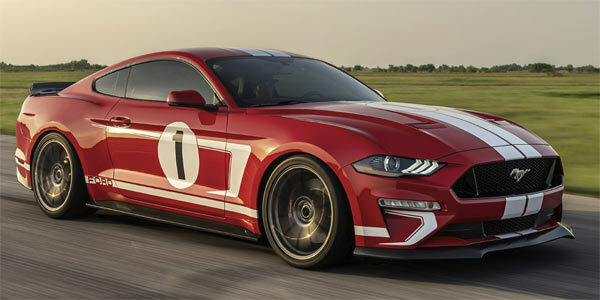 The power plant will be a 5.0-liter V-8 with 3.0-liter supercharger pushing 808HP and 677 pound-feet of torque. This equates to a 0-60 mph time of 3.3 seconds and a touch over 200 mph. Each of the limited models will weigh in at $89,950 and will come with its own letter of authenticity, serial numbered dash plaque, engine plaque and personal letter from Hennessey CEO John Hennessey. Tempted? ← Previous Story Are Dodge Demon Owners Pi**ed At The New Redeye?